The 2017 AAA 400 Drive for Autism is a Monster Energy NASCAR Cup Series race held on June 4, 2017, at Dover International Speedway in Dover, Delaware. Contested over 406 laps, extended from 400 laps due to overtime, on the 1-mile (1.6 km) concrete speedway, it was the 13th race of the 2017 Monster Energy NASCAR Cup Series season. Dover International Speedway, the track where the race was held. Dover International Speedway is an oval race track in Dover, Delaware, United States that has held at least two NASCAR races since it opened in 1969. In addition to NASCAR, the track also hosted USAC and the Verizon IndyCar Series. The track features one layout, a 1 mile (1.6 km) concrete oval, with 24° banking in the turns and 9° banking on the straights. The speedway is owned and operated by Dover Motorsports. 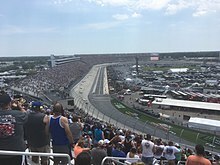 The track, nicknamed "The Monster Mile", was built in 1969 by Melvin Joseph of Melvin L. Joseph Construction Company, Inc., with an asphalt surface, but was replaced with concrete in 1995. Six years later in 2001, the track's capacity moved to 135,000 seats, making the track have the largest capacity of sports venue in the mid-Atlantic. In 2002, the name changed to Dover International Speedway from Dover Downs International Speedway after Dover Downs Gaming and Entertainment split, making Dover Motorsports. From 2007 to 2009, the speedway worked on an improvement project called "The Monster Makeover", which expanded facilities at the track and beautified the track. After the 2014 season, the track's capacity was reduced to 95,500 seats. Kyle Larson was the fastest in the first practice session with a time of 22.512 seconds and a speed of 159.915 mph (257.358 km/h). Kyle Busch was the fastest in the second practice session with a time of 22.779 seconds and a speed of 158.040 mph (254.341 km/h). Kyle Larson was the fastest in the final practice session with a time of 22.870 seconds and a speed of 157.411 mph (253.328 km/h). Kyle Busch led the field to the green flag at 1:19 p.m. The first run of green flag racing lasted just 17 laps before Ryan Sieg went for a solo spin in Turn 2, bringing out the first caution of the race. Ricky Stenhouse Jr. opted not to pit under the caution and assumed the race lead. Exiting pit road, Busch's left-rear tire detached from the car. It was found that one of the airguns the 18 team used to change the tires didn't switch to the setting required to tighten the lug nuts. Back to green on lap 22, Martin Truex Jr. achieved a better restart and took the lead. Staying out proved costly for Stenhouse on lap 47 when his right-front tire went flat and his car slammed the wall in Turn 3, bringing out a second caution. Kyle Larson took just right-side tires and exited pit road with the race lead. Chase Elliott (speeding) and Denny Hamlin (uncontrolled tire) restarted from the tail-end of the field on the ensuing restart for pit road infractions. Restarting on lap 52, the race remained green for the next 10 laps before Stenhouse slammed the wall a second time in Turn 4, bringing out the third caution. On the lap 65 restart, Kurt Busch got loose underneath Larson in Turn 1, overcorrected, turned up the track and slammed into Brad Keselowski, sending him into the wall, bringing out the fourth caution. Keselowski called the incident "one of them racing deals" and the field just "[lined] up double file and somebody got loose and just took us out. What a bummer. Just one of them racing deals." The race returned to green on lap 104 and Truex won the first stage, bringing out the sixth caution on lap 120 for the end of the stage. Larson opted not to pit and took the lead. Trevor Bayne restarted from the tail-end of the field on the following restart for speeding on pit road. When the race resumed on lap 128, Larson started pulling away from the field. By lap 134, he was two seconds ahead of Matt Kenseth in second. By lap 140, that lead grew to 3.6 seconds. Danica Patrick brought out the seventh caution on lap 144 when she spun out in Turn 4. Michael McDowell took the lead after opting not to pit. Larson retook the lead with ease on the lap 150 restart. Unlike the short-run, caution-filled first stage, the second stage settled into a green flag lull with 43 straight laps of green flag racing. Larson pulled to a lead of roughly three seconds and held there until caution flew for the eighth time on lap 193 when Joey Logano's right-front tire went flat and he slammed the wall in Turn 3. Larson spun the tires on the lap 198 restart, but maintained the lead over Truex. As opposed to the last run, Larson drove away from the field, Truex caught Larson on lap 209 and passed him in Turn 1 to take the lead on lap 212. Caution flew for the ninth time on lap 219 when Landon Cassill's right-front tire went flat and his car slammed the wall in Turn 2. Truex exited pit road with the race lead, while Larson exited 19th. The race resumed on lap 222 and Truex won the second stage, and caution flew for the 10th time for the conclusion of the stage. Larson took just right-side tires and exited pit road with the race lead. Ryan Blaney broke a rear axle on the pit stop and took his car to the garage. He returned to the race two laps down. Two laps after the lap 248 restart, Truex got loose and lost second to Jimmie Johnson. Debris on the frontstretch brought out the 11th caution on lap 263. Resuming green flag conditions with 132 laps to go, the race remained green long enough for a cycle of green flag pit stops with 75 to go. Larson pitted from the lead the following lap, handing it to Johnson. Regan Smith, driving in place of the injured Aric Almirola, slammed the wall in Turn 2 after his right-front tire went flat bringing out the 12th caution. Ty Dillon exited pit road with the race lead. The race returned to green with 65 to go. Exiting Turn 2 with 58 to go, Chris Buescher got loose and into Paul Menard, sending him into the inside wall on the backstretch, bringing out the 13th caution. The race restarted with 52 to go. Larson powered by Johnson on his outside in Turn 1 to take second with 42 to go, and passed Dillon on the high-side to take the lead with 39 to go. Johnson passed Dillon to take second and cut Larson's lead to just around a second. But as the laps started to wind down, Larson increased the gap and had the race in check. The lead he built up evaporated when David Ragan suffered a right-front tire blowout and slammed the wall in Turn 2 with four laps to go, bringing out the 14th caution and set up an overtime finish. Ragan's wreck laid oil all down the backstretch and NASCAR had to apply speedy-dry to clean it up. The race restarted in overtime with two to go. Johnson achieved a superior restart to Larson and took the lead. Dillon got loose exiting Turn 2 and came down across the nose of Ryan Newman. His car turned back up track and was t-boned by Erik Jones, triggering a multi-car wreck on the backstretch and bringing out the final caution. Johnson had crossed the overtime line, located on the backstretch at the R of Dover, and was in Turn 3 when the caution ended the race and was declared the winner. Fox Sports covered their 17th race at the Dover International Speedway. Mike Joy, five-time Dover winner Jeff Gordon and two-time Dover winner Darrell Waltrip had the call in the booth for the race. Jamie Little, Vince Welch and Matt Yocum handled the action on pit road for the television side. MRN had the radio call for the race which was also simulcasted on Sirius XM NASCAR Radio. ^ "2017 schedule". Jayski.com. Jayski's Silly Season Site. May 5, 2016. Retrieved May 10, 2017. ^ "Dover International Speedway". NASCAR.com. NASCAR Media Group, LLC. January 3, 2013. Retrieved May 10, 2017. ^ "Entry List". MRN.com. Motor Racing Network. May 30, 2017. Retrieved May 30, 2017. ^ "First Practice Results". MRN.com. Motor Racing Network. June 2, 2017. Retrieved June 2, 2017. ^ "Qualifying Results". MRN.com. Motor Racing Network. June 2, 2017. Retrieved June 2, 2017. ^ "Second Practice Results". MRN.com. Motor Racing Network. June 3, 2017. Retrieved June 3, 2017. ^ "Final Practice Results". MRN.com. Motor Racing Network. June 3, 2017. Retrieved June 3, 2017. ^ "AAA 400 Drive for Autism Results". MRN.com. Motor Racing Network. June 4, 2017. Retrieved June 4, 2017. ^ "Points standings" (PDF). Jayski.com. Jayski's Silly Season Site. June 5, 2017. Retrieved June 5, 2017. ^ "Manufacturer standings" (PDF). Jayski.com. Jayski's Silly Season Site. June 5, 2017. Retrieved June 5, 2017. ^ a b Paulsen (June 6, 2017). "NASCAR Woes Continue, This Time at Dover". SportsMediaWatch.com. Sports Media Watch. Retrieved June 7, 2017. ^ Spencer, Lee (June 2, 2017). "Kyle Larson tops first Cup practice at Dover". Motorsport.com. Dover, Delaware: Motorsport Network. Retrieved June 2, 2017. ^ Gelston, Dan (June 2, 2017). "Kyle Busch wins pole for Cup race at Dover". Associated Press. Dover, Delaware: AP Sports. Associated Press. Retrieved June 2, 2017. ^ Spencer, Reid (June 2, 2017). "Kyle Busch shows speed with Coors Light Pole at Dover". NASCAR.com. Dover, Delaware: NASCAR Wire Service. Retrieved June 3, 2017. ^ Spencer, Lee (June 3, 2017). "Kyle Busch leads second Dover Cup practice". Motorsport.com. Dover, Delaware: Motorsport Network. Retrieved June 3, 2017. ^ Spencer, Lee (June 3, 2017). "Kyle Larson tops final practice at Dover". Motorsport.com. Dover, Delaware: Motorsport Network. Retrieved June 3, 2017. ^ Gluck, Jeff (June 4, 2017). "The Top Five: Breaking down the Dover race". JeffGluck.com. Dover, Delaware: Jeff Gluck. Retrieved June 8, 2017. ^ Pockrass, Bob (June 4, 2017). "Kyle Busch's crew chief faces potential suspension after tire comes off". ESPN.com. Dover, Delaware: ESPN Inc. Retrieved June 8, 2017. ^ a b Knight, Chris (June 4, 2017). "Gutsy pit call backfires on Ricky Stenhouse Jr. at Dover". Catchfence.com. Dover, Delaware: Catchfence. Retrieved June 8, 2017. ^ a b c d e f g h i Engle, Greg (June 4, 2017). "The NASCAR AAA 400 at Dover International Speedway as it happened". CupScene.com. Cup Scene. Retrieved June 8, 2017. ^ Finney, Mike (June 4, 2017). "NASCAR at Dover notebook: Ugly moment for Kurt Busch, Keselowski: 'One of them racing deals'". Delaware State News. Dover, Delaware: Independent Newsmedia Inc. Retrieved June 8, 2017. ^ Crandall, Kelly (June 4, 2017). "Kurt Busch finds Monster-sized trouble at Dover". Racer.com. Dover, Delaware: Racer Media & Marketing, Inc. Retrieved June 8, 2017. ^ James, Brant (June 4, 2017). "Jimmie Johnson wins at Dover, ties Cale Yarborough". USA Today. Dover, Delaware: Gannett Company. Retrieved June 8, 2017. ^ White, Tucker (June 4, 2017). "Kurt Busch pounds wall twice in Dover Cup race". SpeedwayMedia.com. Speedway Media. Retrieved June 8, 2017. ^ Spencer, Lee (June 4, 2017). "Truex wins first two stages, but misses out on Dover victory". Motorsport.com. Dover, Delaware: Motorsport Network. Retrieved June 8, 2017. ^ Spencer, Reid (June 4, 2017). "Truex wins two stages, but denied the big prize". NASCAR.com. Dover, Delaware: NASCAR Wire Service. Retrieved June 8, 2017. ^ Spencer, Reid (June 4, 2017). "Ty Dillon: 'We can run up front with the big boys'". NASCAR.com. Dover, Delaware: NASCAR Wire Service. Retrieved June 8, 2017. ^ Santa Barbara, Mike (June 4, 2017). "AAA 400: Johnson wins for 11th time at Monster Mile". Dover Post. GateHouse Media. Retrieved June 8, 2017. ^ Gelston, Dan (June 4, 2017). "Johnson extends track record with 11th win at Dover". Associated Press. Dover, Delaware: AP Sports. Associated Press. Retrieved June 4, 2017.